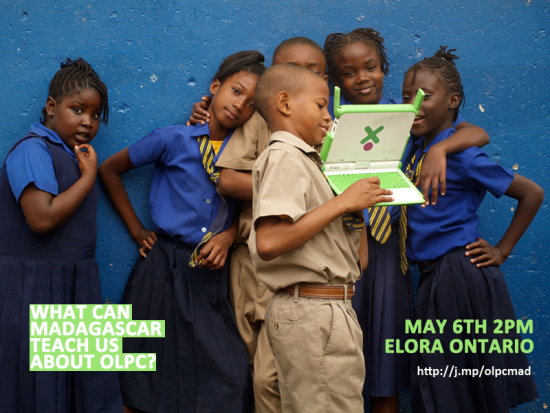 Over the weekend I heard about an OLPC community BBQ which will take in Elora, Ontario near Toronto next Saturday, May 6. The event will bring together some of the key people working on OLPC projects in Madagascar and Haiti as well as members of the Canadian OLPC community. We will show how the 20 years of intensive work of Stéfano Palazzi which in Madagascar made the children the heart of building a community! YES! In Nosy Komba, Madagascar children are the chiefs of the village! We will also share our difficulties and challenges, our dreams for the future and our vision for a better world! Developing creativity with the XO and Sugar, reading, discovering, telling stories, understanding their environment and their village, learning photography, history, documentation, mathematics, media making, expressing themselves by learning and learning differently: Is there any thing more beautiful about education? The Canadian OLPC community welcomes you and family, any internationally-minded educators you know, and students of all ages, to come learn what's really happening out there...please come share everyone's growing laptop/learning project experiences to build the Alearning Dream! Spread the word and RSVP with [email protected] for address & transportation options. Resumen en español: El proximo sábado, 6 de Mayo, voluntarios trabajando en proyectos de OLPC en Haiti y Madagascar, se reunirán cerca de Toronto para una parrillada y compartir y discutir sus experiencias.